I have achieved my goal end of last month and I managed to sent out some Christmas presents ahead of time! I have always set the same goal and only this time I succeeded. There is more shopping to do for people that we will visit and hand deliver the presents and some that I might randomly shop for and send out last minute as surprises. I'll have to set my goal early again for next year 'cause the no rush feeling is kind of relaxing! Here is a Reindeer, Sleigh and Santa bento. Sleigh and reindeer sandwiches made with Plunger cookie cutter by Nordic Ware with fruit leather accents, Santa pick, and bread crust antlers. In Santa's sack are seedless grapes in a silicone cup. Also, sugar snap peas and sprinkles snowflakes. This lunch is packed in an Ecolunchbox Solo Rectangle. 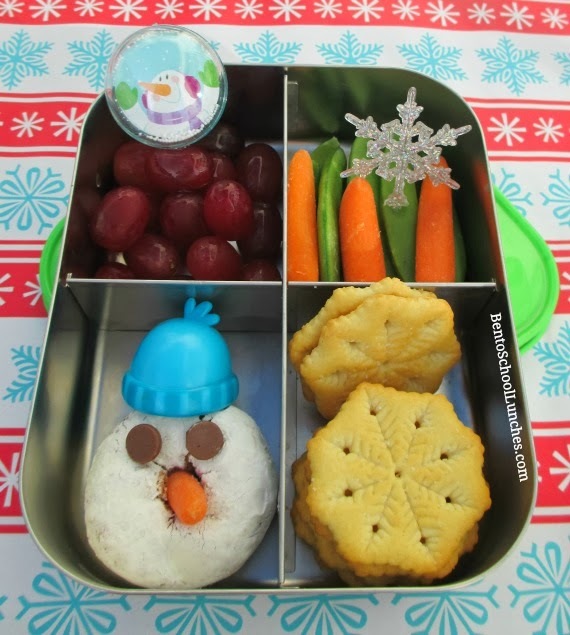 Here is a Snowman snack bento I made last week. Snowman mini donut with a piece of carrot nose, choc chip eyes and a cupcake pick hat. Baby carrots and sugar snap peas. Seedless grapes. This snack is packed in a LunchBots Quad. What a cute snack and lunch!! 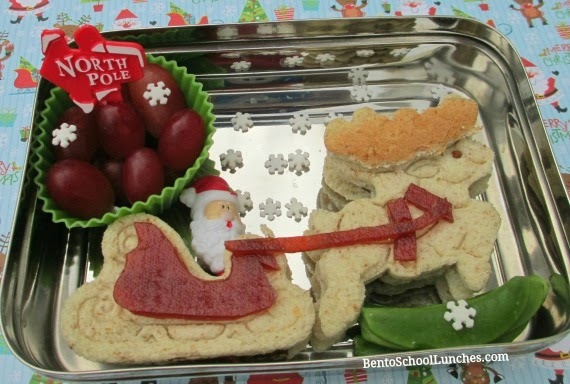 Love the reindeer and sleigh bento! Looks like a piece of art! That's all so cute! You are awesome! Such a lovely xmas bento!!! !